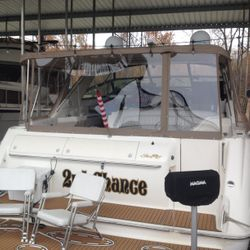 Heber Springs Marine Upholstery specializes in complete interior restoration for your boat. Why choose us? Marine upholstery requires careful craftsmanship that incorporates special materials that are able to withstand harsh outdoor elements and heavy use. We are dedicated to using only the best materials.... everything from the staples we use to the thread we sew with have been rigorously tested to last. Heber Springs Marine Upholstery is located just minutes from Greers Ferry Lake on Highway 110 West.